As in any fashion industry, there are leaders and there are followers. Quorum has earned a strong reputation for being a style innovator and design leader. Customers who appreciate innovative style will find a home here at Quorum. 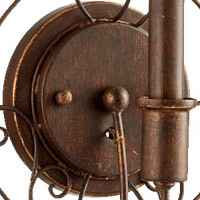 Q What are the materials used for this fixture? wood? metal? A The Quorum Salento 6 Light Chandelier 6106-6-70 main frame and the base of this chandelier is made of steel and the hanging accents of the chandelier are made of polyresin. Q Does 6106-6-70 come in another finish? I was just looking in a catalog at a store and it showed an umber finish as well but I do not see that on website. 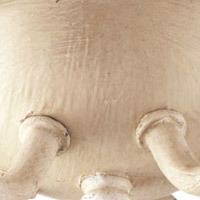 A Yes, the Quorum Salento 6 Light Chandelier 6106-6-70 is also available in French Umber 6106-6-94. Q What is the length of chain the fixture comes with? We want two, one to hang in a living room closer to ceiling and one to hang in a dinning room where the chain would need to be longer to get to 55" above the floor. 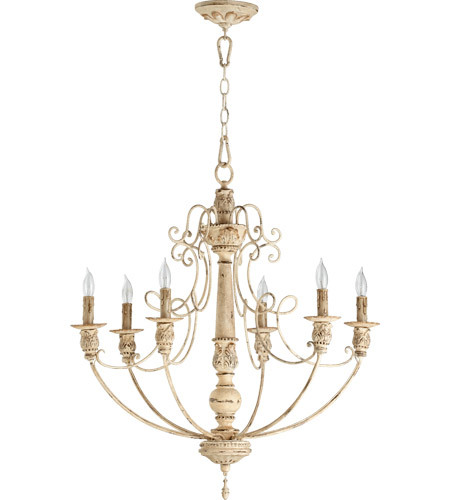 A The Quorum Salento 6 Light Chandelier 6106-6-70 comes with 8 feet of chain and 10 feet of wire.